The Raider Dual-Ring 16 LED 120mm Rainbow RGB Fan is a hydraulic bearing silent fan allowing for a quiet operation during use with a noise level of approx. 21dB(A). 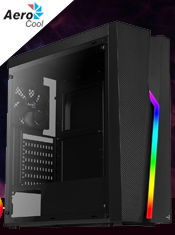 The fan has an RGB function with 358 different modes, meaning no matter what colour you want your build the Raider can do it. The fan can be controlled via the hub that is included in the Raider RGB gaming case and an RF remote controller allowing you to change the colour and the mode of your fan easily and efficiently. The dual-Ring fan offers a greater performance and light emitted by each fan installed making this a great choice. 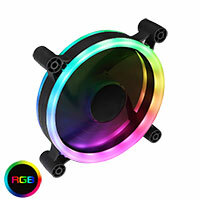 Dual-Ring LED - 16 LED Dual-Ring Rainbow fan offers an excellent output of light and vivid colours to your PC. Bearing Type - The Raider fan made using hydraulic bearing offers greater reliability and efficiency. Compatibility - The fan is compatible with the Raider RGB allowing you to add more fans to your build and enable stunning dynamic lighting effects. Control - The fan is compatible with a hub and RF remote controller giving you more control when it comes to changing your LED lighting. The RF remote controller allows you to change the mode and speed of your fans. 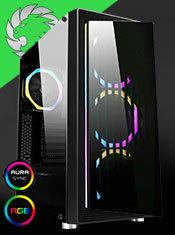 Multiple RGB Modes - The Raider fan has 358 different colour modes, so your build will never be dull.